Few today are aware that in 1948-1949 the United States played the decisive role in securing Indonesia’s independence from the Dutch. 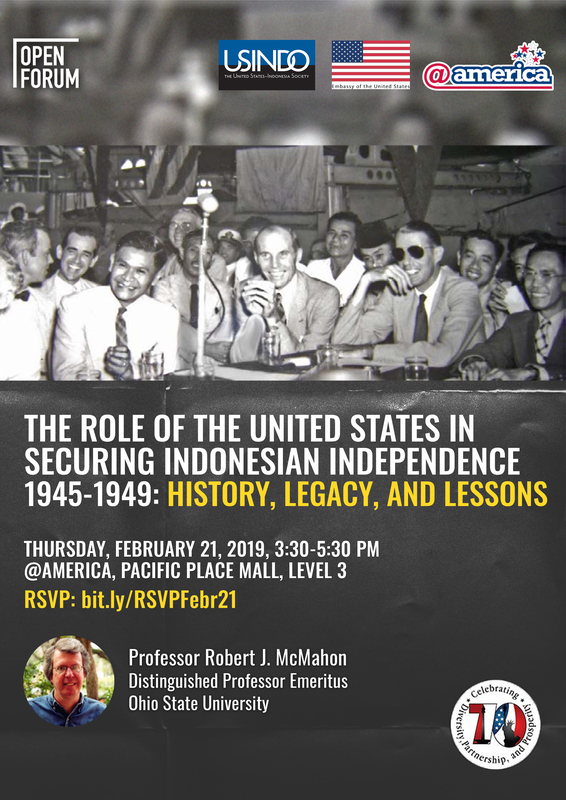 This year’s 70th anniversary of US-Indonesia diplomatic relations is thus a fitting time for Indonesians and Americans to learn more about the U.S. role in Indonesia’s independence and the foundations of the US-Indonesia relationship, valuable for us now and for the decades ahead. 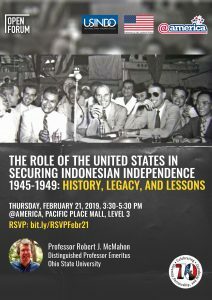 The strong stance adopted by the U.S. in 1949 supporting Indonesian independence came about only after a process of gradual evolution leading ultimately to decisive change. After World War II and the U.S. wartime cooperation with its Dutch European ally, in contrast to its slight experience with Indonesia’s republican nationalists, the U.S. initially approached the question of the future of the Netherlands East Indies with a mind-set of Dutch-leaning neutrality, while trying to see if the two principal parties could resolve their differences. The U.S. provided a facilitation role for a series of negotiations between the Dutch and the Indonesian Republican leaders, later also involving the United Nations and others. However, even with facilitation and mediation assistance of third parties, the irreconcilable positions of the two main parties rendered the negotiations intractable. During this time two Dutch military actions in Indonesia, particularly the second in December 1948, strongly affected the U.S. position. Weighing information and opinion from many sources, including Indonesian nationalists, the U.S. press, Congress, and its own views, the U.S. by 1949 viewed Dutch military actions in Indonesia as a threat to stability and order, and concluded such actions would make it impossible to include the Netherlands in the U.S. plans for expanded post-war European recovery under the Marshall Plan, the centerpiece of its post-war foreign policy. Achieving a settlement became imperative. It was then that the United States decided to place its power and prestige with the Indonesian republican nationalists. The U.S. made it clear to the Netherlands in 1949 that they needed to conclude negotiations on Indonesian independence with the Indonesian nationalists if the Netherlands were to remain included in planned U.S. recovery aid to Europe. That policy shift paved the way for the conclusion of negotiations, leading to the simultaneous ceremonies in Amsterdam and Jakarta seventy years ago that marked the birth of a new nation on December 27, 1949. We are delighted that Professor Robert J. McMahon, Ralph D. Mershon Distinguished Professor Emeritus, Ohio State University, one of the world’s top historians on this period, will join us February 21st to give us an authoritative understanding of these momentous times. His presentation will be followed by Questions and Answers. His bio is below. Please join us on February 21st for this important event. Space will be limited. Please RSVP HERE or email to usindojkt@usindo.org as soon as possible and not later than February 21, 2019 at 12:00 p.m.
Dean Acheson and the Creation of an American World Order (Potomac Books, 2009). 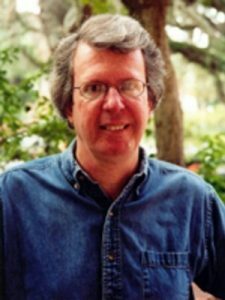 Professor McMahon has also taught at the University of Florida and has been a visiting professor at the University of Virginia, University College Dublin, the Free University (Berlin), and Williams College. In 2001, he served as president of the Society for Historians of American Foreign Relations.